Against truly stiff competition, Tom Savage took home our Bad QB Performance of the Week award for Week 1. It looks like he will not get to defend his title; it’s being reported, though not confirmed by the team, that Deshaun Watson will get the start for the Texans against Cincinnati tonight. Why on earth could that be? Savage was bad, bad, bad. Watson wasn’t any better in a half of relief. Both fell prey to a very good Jacksonville defense, with no help from a very bad Houston offensive line. 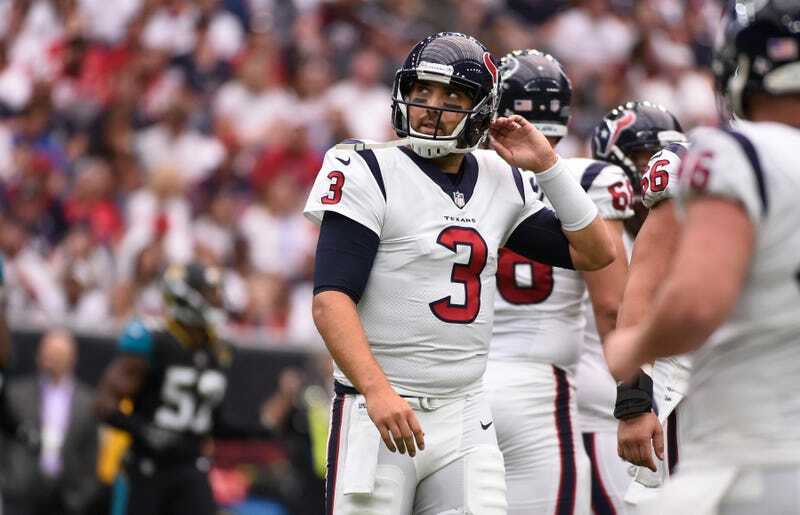 But Savage has been here for three years and the Texans probably know what they have in him, while Watson, their first-round draft pick this spring, has only potential. So not too many people are put out by the decision to let Watson give it a go. One of those people, however, decided to go public. “I’m still trying to figure this out...31 plays and you’re getting benched?” Savage’s agent, Neil Schwartz, asked in an appearance on PFT Live. “I watched all 31 plays, because that was the extent of what Tom saw in the first half,” Schwartz said. “And I can’t figure out why he’s benching Tom. I went through every single play and I even went one step further. I asked two different NFL personnel people, coaches on two separate teams to evaluate and break down the film to see if I was missing something. He went 7 for 13 ... 12 of the 13 balls touched the receiver’s hands. The only ball that didn’t was the strip-sack fumble that they called incomplete. Seven were completions, five were drops. But this is Schwartz’s job; he’s Savage’s agent and advocate. More interesting than the content of this public defense, though, are its existence in the first place, and that Savage approved it. This is all perfect. Savage had the lowest of bars to clear—as Ley wrote, all he had to do was not be Brock Osweiler—and he only needed one half of ugly football to make things messy and bitter. Gonna be a great season!